I turfed out my Invicta gooseberry from the top strawberry bed, plus a huge number of strawberry plants. I am never using weed fabric again for anything other than temporary cover, it doesn’t suit my sloppy gardening methods. Each strawberry plant had a ‘skirt’ of shredded material and getting the dratted stuff off without destroying the plants was difficult. I added a couple of barrows of mature manure from the hotbin, plus a sack of leafmould to keep the worms happy and forked it all in. Stuck the bigger bush in the bed and underplanted with about half the strawberries. 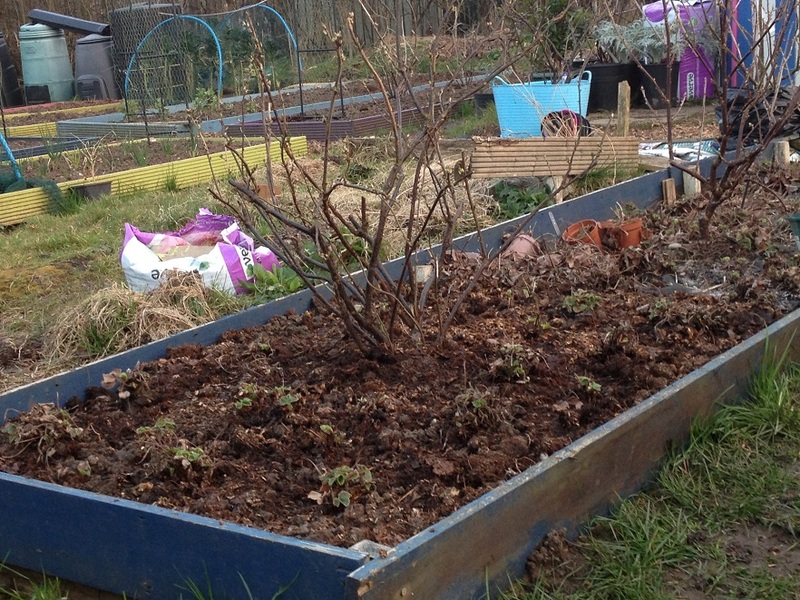 So now that top bed is all redcurrants and strawberries. The other bush is in a 42L trug for now, the gooseberry is in a flower bucket and the baby bushes are in pots. The larger currants have had a swift prune and if the babies take I’ll give them to my brother as part of a housewarming present later this year. With all the fruit bushes I have, I am thinking it might be better to make the other plot mainly fruit. Perhaps with a gurt big cage of netting. Allotment Corner in the kitchen is in full swing. I’ve appropriated the sweetcorn forks as they are the perfect size and shape for helping my fumble fingers work with seedlings. Piero is resigned to losing both the nice breakfast table and all the south-facing windowsills for my chillies/aubergines/cape gooseberries etc. He’s less resigned to my muddy boots and they have to live outside. I have a bag of spare strawberry plants in the hall which need potting up and sticking on the balcony till I know what else to do with them. Plus a massive backlog of potting up and not enough compost stocks. My second sowing of peas are coming through, the sweetpeas need splitting up, some lettuce needs its own space and the onions are up. The onions also have a mystery chilli interloper, which is my own fault for re-using the compost from what I thought were defunct chilli sowings. Oh, and the Pentland Javelins are definitely up and away!